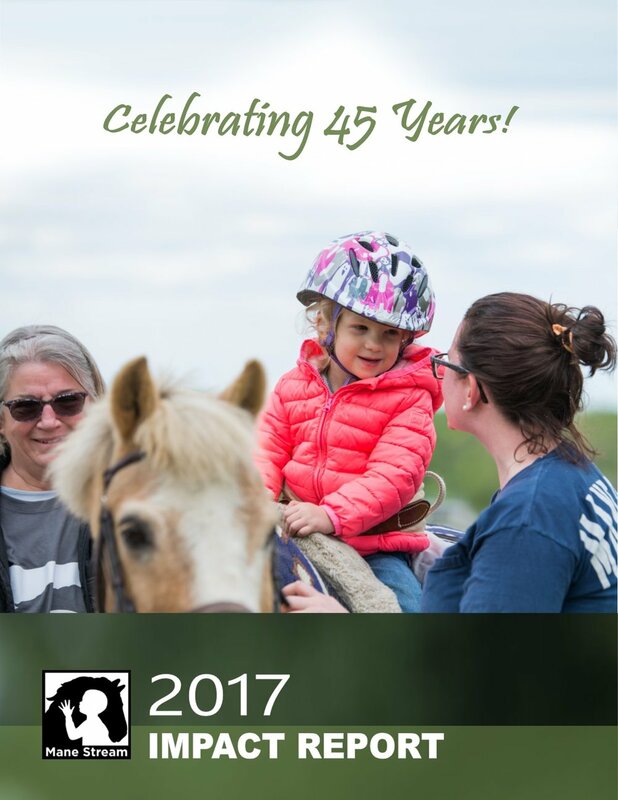 2017 Impact Report: Celebrating 45 Yrs! The Mane Stream mission is to improve the quality of life for individuals with physical, developmental, emotional and medical challenges through a diverse program of equine assisted activities, therapy and educational initiatives. Letter from the President: Harriet Beecher Stowe wrote, "Never give up, for that is just the place and time that the tide will turn." Here at Mane Stream we agree whole-heartedly. 2015 was an incredible year of re-growth, innovation, and expansion. We came from worrying about how to keep the lights on and our programs running at the end of 2014 to the expansion of all of our therapy offerings and the introduction of many new programs for even more members of our community in 2015. Far from giving up when times were tough, we dug deep and redoubled our efforts to make Mane Stream successful. I am proud to report that our financials are once again healthy and we are serving more people with more programs than ever before. As I look back on this past year I am overwhelmed with gratitude! I am grateful to our amazing and dedicated staff, our tremendous volunteers, my fellow board members, and all the generous donors who have supported us. While there are many riding programs for people with disabilities across the country, I can promise you there is no place like Mane Stream. It is a very special place where wonderful things happen every day for a wide variety of deserving people. Thank you to everyone who has helped and continues to help keep Mane Stream growing and thriving. Thank you for never giving up! Letter from the President: The ancient Greek philosopher Heraclitus said that nothing on this earth remains unchanged over time. The world is always in flux. While Mane Stream is no exception to that basic law of nature, 2014 has brought more challenges for us in one year than we ever expected. The difficult economic climate of recent years has offered tremendous challenges for everyone. Like nearly all other non-profit organizations we have struggled to raise the funds needed to run our programs. But as we moved into the fourth quarter of the year it became abundantly clear that here at Mane Stream we were going to have to make some painful and important decisions. We needed to cut our budget. And we had to do it without sacrificing our services or losing sight of our mission. While change is often difficult, it can also bring great things. Sometimes it forces us to be smarter and better. I believe that is what has happened at Mane Stream. Thanks to the hard work and creativity of our staff, volunteers and Board of Directors we are better than we were. And we are well poised to face any and all changes and challenges that may come our way in 2015. Mane Stream celebrated forty one years of service to individuals with special needs in 2013. The programs that we provide include Adaptive Riding, Equine Assisted Occupational Therapy, Physical Therapy and Speech Therapy, Interactive Vaulting, and Summer Day Camp. Mane Stream instructors and therapists provided more than 3,200 hours of service for 171 participants at the Oldwick farm. The programs at Mane Stream were made possible with the help of 229 program volunteers that kept weekly commitments to assist in lessons, therapy sessions, camp and an additional 124 volunteers that played supportive roles throughout the year.